Many people consider Border Collies the world's best herding dog, bar none. Their herding instinct is different than that found in most herding dogs. Most breeds of herding dogs drive the livestock away from the handler but Border Collies circle the cattle and bring them back to the handler. Initially Border Collies don't use force to move cattle, but moving quickly in an almost-crouched position with their forequarters lower than haunches, they use what is known as the "eye", a hypnotic threatening stare down that intimidates the cattle causing them to move in the desired direction. If this does not work the dog escalates force by barking, nipping, and biting until the livestock move in the desired direction. A Border Collie is a hard working breed of herding dog that originated in Northumberland along the border between Scotland and England. Originally bred as a sheepdog, this hardy, agile, untiring dog, is capable of handling any type of herd, including cattle. They are joyous, energetic, alert, and eager dogs displaying grace and agility in equal measure. There is wide variety in the breed. 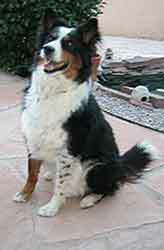 The coat can be medium-length or short and comes not only the common black and white but also brown, sable or merle. They can have tan markings on the face, ears, legs, and tail. They have a soft, dense undercoat. Ears can be erect or tipped over. Eyes range from deep brown to amber or blue and sometimes have one eye of each color. There are smooth coated, short haired, and rough coated varieties. They are a very intelligent and highly energetic breed which become easily bored and need to be provided with lots of interesting things to do or they may develop serious behavior problems..
A medium-sized dog, the males weigh 30 to 45 pounds and are 19-22 inches at the withers. The slightly smaller females weigh 25 to 42 pounds and stand 18-21 inches.